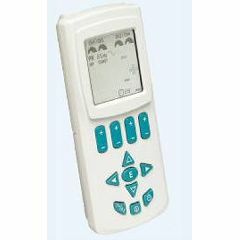 The QuadStar II is a portable four channel digital NMS, INF and TENS device. The unique device with 3 waveforms, symmetric biphasic, pulsed sine and asymmetrical biphasic can be programmed to deliver NMS, INF or TENS therapy . There are 9 preprogrammed Fixed Sequences which enable the user to program 20 minutes of INF followed by 20 minutes of NMS therapy and ending with 20 minutes of TENS therapy. A Programmable Sequence allows the user to customize the therapy and times. A graphic representation of the timing parameters is shown on the screen to assist the user to program the on/off ramps and on/off times. In addition there is a patient lock system when activated prevents the patient from changing any parameters. When the lock is turned off, a patient compliance meter is displayed. Premodulated INF (Using one Channel): A mixed Interferential Beat Frequency will be produced only out of CH 1 and/or CH 3. Sweep 3: Beat Frequency Modulates from 1-150 Hz and back over 20 seconds (10 second increase, 10 second decrease. Constant: Pulse Rate (Hz) is adjustable from 1-120 Hz and Pulse Width (µS) is adjustable from 10-250 µS. B (Burst): 8 Pulses per burst, 2 bursts per second. Pulse Width (µS) is adjustable from 10-250 µS. M (Modulation): Pulse Rate (Hz) is Adjustable from 1-120 Hz and Pulse Width (µS) is adjustable from 10-250 µS and decreases 50% and back to set value over a 10 second cycle. Using the product as per my PT instructions. Had multiple knee surgeries. Need this product to re-educate and build up large muscles. Is there an instruction manual for the quadstar II ? Does it come with a wall adapter? Yes it comes with a substantial wall adapter! does this come with an ac adpter, hard carrying case and can you use recahrageable batteries? Oh and when I receive it is it a brand new machine and what is the waranity? Relatively new, but I've enjoyed mine for over a year. Like the several modes. Is there an easy way to figure out the QuadStar 2, for a layman? I'm lost.